Obituary – Hay, Reinhold Fred “Jack” « Perry High School Alumni Association, Inc.
﻿Funeral will be at 2 p.m. Saturday at the First Baptist church of Barnsdall for R. F. (Jack) Hay, 72, retired educator, who died at 4:30 p.m. Wednesday in the Phillips Medical center at Bartlesville following an illness of several months. Officiating will be Rev. Ross Adkins, pastor of the First Church of God of Dewey; Rev. Ted Kersh, First Baptist church of Barnsdall; Rev. Donald Bailey, First Christian church of Barnsdall and Rev. Clayton Walters, First United Methodist church, Pawhuska. Burial will be in the Ethel Reece cemetery at Barnsdall under direction of the Barnsdall Funeral service. Military services will be conducted at graveside. Hay was born near Perry, July 19, 1904, to Reinhold Gottfried and Elizabeth (Hofmann) Hay. 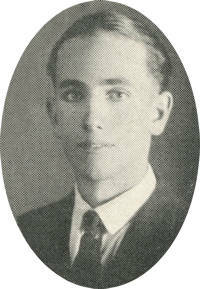 He attended Bethany Normal school and graduated from Perry high school in 1925. Following high school he attended Oklahoma A. & M. college where he received his BS degree in education. He also attended Central State college at Edmond and the University of Colorado at Boulder, later obtaining his master’s degree in education at Oklahoma A. & M.
He first taught at Avant then served as superintendent of schools at Barnsdall five years; superintendent at Shidler seven years and superintendent at Dewey 14 years. He retired in July, 1970 and moved to Pawhuska. He was married to Mae Kelley, May 8, 1948 at Siloam Springs, Ark. He was a veteran of World War II as a Navy enlistee where he served from 1941 to 1945. Following discharge he returned to Barnsdall and moved to Shidler the following year. He was a member of the United Methodist church at Pawhuska, the American Legion post at Shidler, the Lions, Kiwanis and Rotary clubs, Perry Masonic lodge, was a 32nd degree Mason and member of the Tulsa Consistory, Akdar Shrine at Tulsa, the Barnsdall Eastern Star, the National Retired Teachers association board of directors under appointment from Gov. David Boren and was a life member of the Cherokee Strip Historical society. Survivors include his wife of the home; two brothers, John Arthur Hay of Salem, Ore., and Carl William Hay of Wichita and one sister, Mrs. Violet King, Edmond. Morton Hay, northwest of Perry, is a nephew and Mrs. Billy Hayton, Billings, is a niece.